Marsha Creates Texture, Depth & Vibrant Color in her realistic watercolor paintings. Sunday, September 17th. 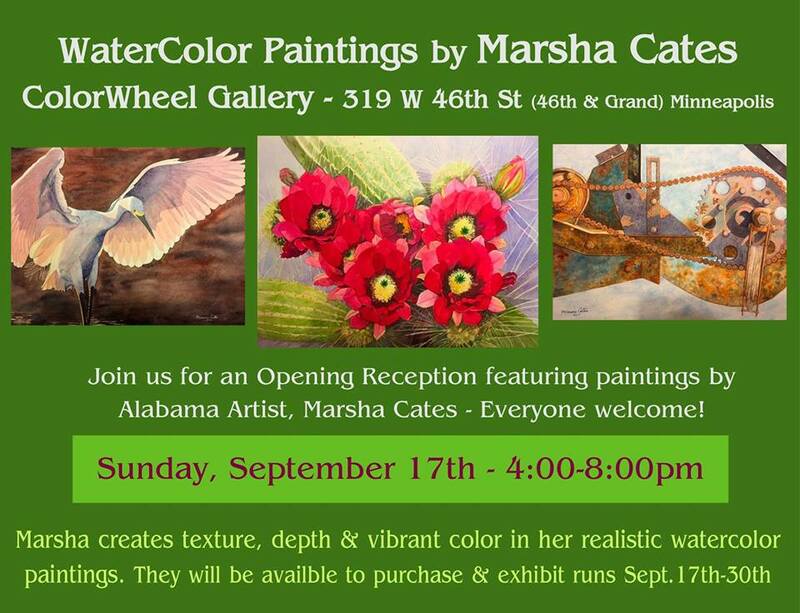 4:00-8:00pm Join us for an Opening Reception featuring paintings by Self Taught, Alabama Artist, Marsha Cates – Enjoy sweet iced tea & treats while you talk with Cynthia Reuss about her Mother’s Beautiful Paintings… We are so lucky that she brought them up to Minneapolis to share with us! The Paintings will be availble to purchase & exhibit runs Sept. 17th-30th. ColorWheel Gallery hours .. Tues-Sat 12-7pm – Everyone welcome!